I’m in a small yahoo group of like minded artists. We have respect for each others talents and knowledge, we critique each others work without fear of being slammed. When we defend our artistic position of a piece, we are listened to and the others may understand the piece more…or not. We’ve been having discussions lately about painting and sketchbooks. I think that’s because we have all signed up for the online workshops at Strathmore Artist Studios. Sorry, I tried to do a link on this for you but it will only take me to my sign in page for the workshops. Give it a Google if you are interested. Back to the subject at hand. Here is the first watercolor I tried after giving it up in school. The important thing for me with this piece is that I threw out ALL THE RULES from school. This would have simply been a muddy mess. I was pleased enough with it to do some other watercolors. Besides throwing out the rules, I also discovered that like the oriental brushwork I was doing at the time, it takes a gentle delicate hand. I can’t do this kind of work if I’m stressed or uptight. I must take deep breathes and relax all my muscles to have control of the medium. HMMMMM, sounds to me like this should be a daily activity. This makes me want to get out my watercolors again! It's lovely! 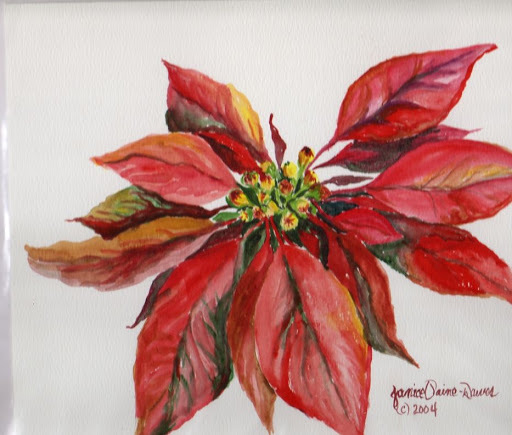 I'm not a 'painter' unfortunately but I love what you have done with the poinsettia. I also love the beautiful trees in snow sidebar of yours.